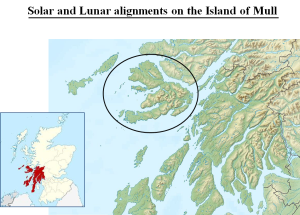 The earlier work (2007-2010) in Argyll was planned in order to attempt to determine whether or not precise solar/lunar alignments exist as proposed by Alexander Thom (1967, 1971). Strong evidence for the existence of planned precise lunar alignments was found. 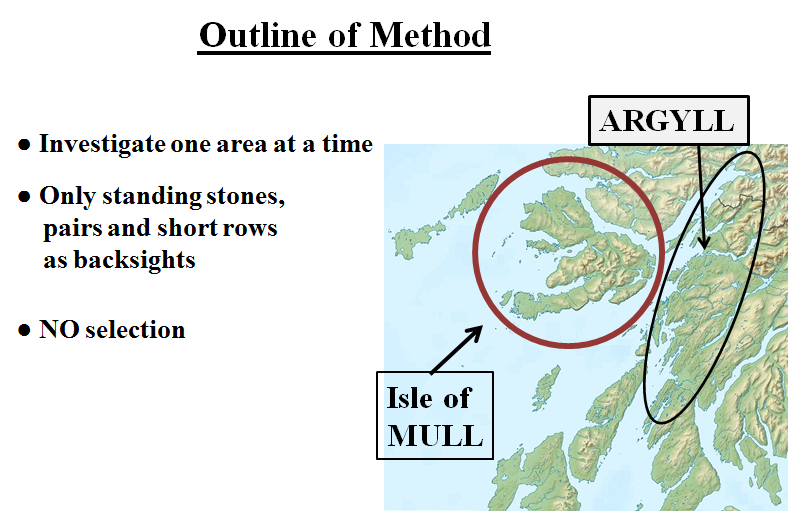 The same methodology used in Argyll was used on Mull. There are 30 standing stone sites on the island of Mull. These were assessed during a major survey of some 300 western Scottish sites by Clive Ruggles et al. and published in 1984 (Ruggles 1984). However they were assessed on the basis of the orientation of the structure. 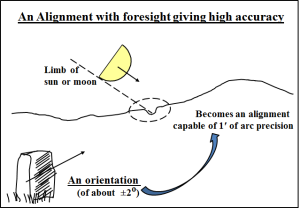 The possibility of precise alignments using indicated foresight features was not considered (see note). No comprehensive assessment of possible celestial alignments using foresight features has previously been undertaken. Alexander Thom assessed a few sites, finding some evidence for lunar alignments (Thom 1971) and a single solar alignment (Thom 1967: 100) . 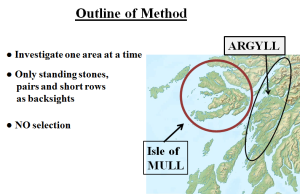 Clive Ruggles undertook a study of the stone rows in northern Mull when he determined approximate declinations using only the stones (Ruggles 1999: 112ff.). In the present survey carried out during 2012/13 the following assessments were made:- 9 Solar alignment sites, 4 lunar alignment sites, 5 waymarkers ( In SW Mull to guide medieval pilgrims to the important early Christian island of Iona), 4 fallen, 8 trees either at the site or obscuring the skyline. In the survey referred to above Clive Ruggles designated the sites ML1, ML2 ... etc. This numbering is adopted here. The solar alignments are considered in the next section. Note:- The distinction between an orientation and an alignment is important. An orientation is a direction derived only from the object itself, be it a flat sided stone, a passage grave etc. and gives at best a precision of one or two degrees. In an alignment the backsight (typically a flat sided stone, a stone pair or short row) marks the observing position and also the direction to a, usually, unambiguous skyline feature, the two together forming the alignment. Such an arrangement is capable of minute of arc precision – perhaps 100 times more precise than an orientation.